Hello readers, just wanted to offer you a free three month trial to our new publication, Supply Chain Risk & Innovation. 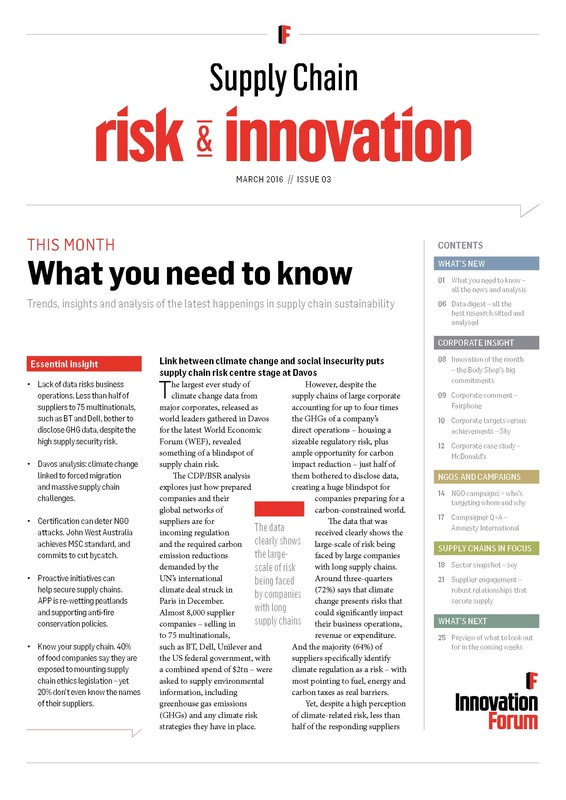 Supply Chain Risk & Innovation (SCRI) is the subscription publication from Innovation Forum. Packed with concise, practical insight into global supply chains, with all the essential information pulled together for your convenience. Published 10 times per year, SCRI is required reading for senior management, buyers and sustainability professionals. The publication costs £495 for a year’s worth of data and analysis. You can get a free three month trial to the 26 page publication here. But the offer ends today, so you might want to get your skates on. In-depth analysis of how brands have developed specific initiatives: where is the value, what are the concerns and risks, what are the savings, what ground rules are required, what about scalability? Compact and comprehensive sector snapshots – what are the current issues and what needs to be done going forward. The March issue contains case studies on Fairphone, McDonald’s and H&M, a sector profile on the soy industry and a feature-length piece on engaging suppliers at scale. For more information or to get in touch contact Eilidh Morrison on Eilidh.morrison@innovation-forum.co.uk.